Storm Strength & Fitness is excited to now offer a Guided Coaching Membership. This membership offers customized monthly programs and supervised instruction with proven results at a terrific value! A Storm Strength & Fitness T-Shirt - what more could you want? $149 enrollment fee applies to guided coaching memberships. Programs will be customized just for you based on an Individual Evaluation, designed for your needs and goals and tailored to your position or active lifestyle. For athletes, that means you'll train differently if you're an offensive lineman, first baseman, middle hitter, or point guard. For active adults, we'll help you hit the waves with more strength and stamina or hit the sand courts with more power in your swing and a quicker first step to the ball. We'll also lower your risk of injury to give you more uptime to enjoy whatever your game or activity of choice is! A coach will guide you through each exercise in your monthly program to clarify any questions and after that, you can work at your own pace & schedule. Of course, we will be around to help you if you need some instruction. 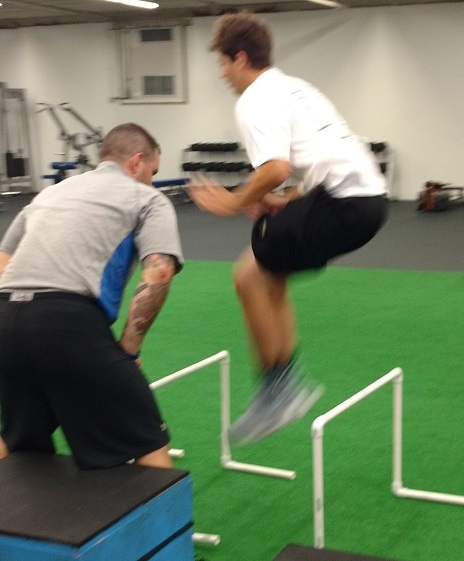 High School Football player in 12 weeks increased his vertical jump by 3.5", broad jump by 9" and his box jump by 5.5" and gained almost 10 lbs. Join now and start seeing your numbers improve too! For best results Storm Strength & Fitness recommends athletes and active adults to go through one of our 12-week programs. After registering for the membership, individuals will come in for a Full Individual Evaluation at Storm Strength & Fitness with our well-trained staff. Movement and Injury Risk Screening - These tests will evaluate how the individual moves and what injuries they are at risk for. Any imbalances or movement deficiencies that can lead to injuries or decreased athletic performance will show up in these tests and will be addressed in each individual’s customized program. Performance Test – The individual will be tested in all the major lifts as well as a variety of other performance tests including Vertical Jump, 20 yard Dash, Agility Test, Conditioning Test, and Strength Tests. The results of these tests will allow our staff to set the individual's movements, weights, and conditioning accurately in their customized program. Survey - The individual will be asked to complete a survey that will tell our staff about their athletic history, injury history, training background, and their future performance and training goals.